ATLANTA — A huge power outage brought the world's busiest airport to a standstill over the weekend, ruining holiday travel for thousands with hundreds of flights on Monday already canceled. Hartsfield-Jackson International Airport in Atlanta lost power shortly after 1 p.m. ET on Sunday, leaving passengers trapped inside airport terminals and some in planes on the tarmac for hours. By late Sunday, the airport had canceled 1,173 flights and delayed 207, according to FlightAware.com. Delta Air Lines, which is headquartered in Atlanta, said it was canceling another 300 flights, mostly to Atlanta, on Monday. Atlanta Mayor Kasim Reed said a fire at the main substation powering the airport triggered the outage, which caused the Federal Aviation Administration to put a ground stop in place, slowing or halting inbound air traffic. "I want to express my sincere apologies to the thousands of passengers whose day has been disrupted in this manner," Reed said during a news conference. "We certainly understand that the outage has caused frustration and anger and we are doing everything that we can to get folks back home right away." Extreme heat and dangerous fumes from the electrical fire prevented firefighters and electrical workers from accessing an underground tunnel to assess the damage for nearly two hours and delayed restoration of electricity to the airport for even longer. Officials were still investigating the cause of the fire and declined late Sunday to rule out terrorism. Reed said all passengers had been deplaned shortly after 10 p.m. ET and law enforcement personnel were combing the airport for any possible security breaches. Delta said it had canceled approximately 900 mainline and Delta Connection flights. The airline said it would issue a waiver to those who were travelling through Atlanta with the airline on Dec. 17, 18 or 19. The airline also said it would give travelers a refund if they would like to cancel their trip because their flight was cancelled or delayed more than 90 minutes. Those arriving for their flights were met with long lines and a pitch dark airport. No escalators, elevators or information screens were operational Sunday afternoon and evening. Brian Moote, 36, the morning host of an Atlanta radio show, said he was returning home on a flight from Dallas when the power went out in the airport. Moote said he and his fellow passengers had been stuck in their plane on the tarmac for nearly six hours, beginning at around 12:30 p.m. ET. The pilot warned passengers that the power could be out until 11 p.m. ET, Moote told NBC News over the phone. "People are being really calm and cool about it just because we realize it’s not the airline's fault," he said. "But the babies are getting restless. We don’t have any food; nobody has eaten. They’re trying to get us water." 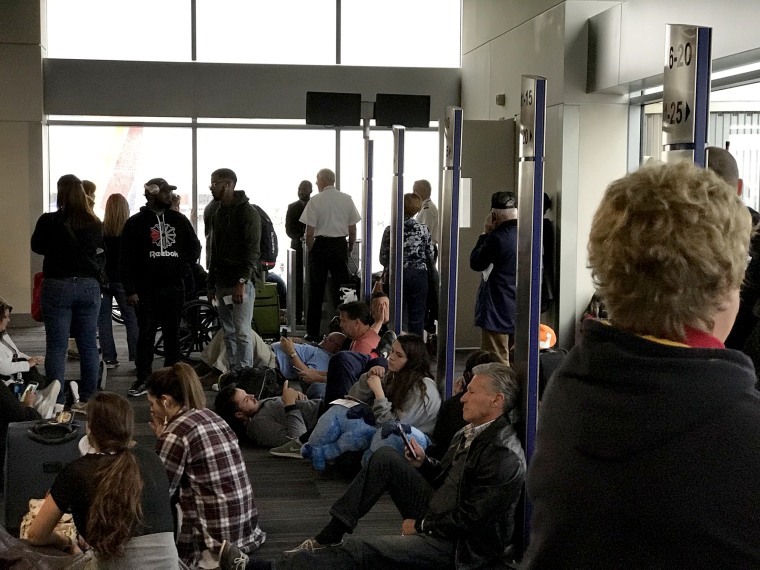 Moote said that he had been told the passengers would be removed from the plane soon, but the airport had a limited number of stair cars and needed buses, so there wasn't a clear timetable. "It’s just a complete catastrophe in their ability to evacuate an airport," Moote said. "If this is another type of disaster, we’d just be toast." The city later opened its convention center for stranded passengers and was providing bus service to get there. Fast food chain Chick-fil-A was donating food, the mayor said. Just before midnight Sunday, around 11 hours after the initial outage, Reed tweeted that all power had been fully restored to the airport. According to the airport, Hartsfield-Jackson serves approximately 275,000 passengers and averages 2,500 flight arrivals and departures every day. Demi Douglas reported from Atlanta, Georgia, and Phil McCausland reported from New York City. Demi Douglas is a member of the NBC News Digital staff. Phil McCausland is an NBC News reporter focused on the rural-urban divide. Jay Blackman and Terry Pickard contributed.